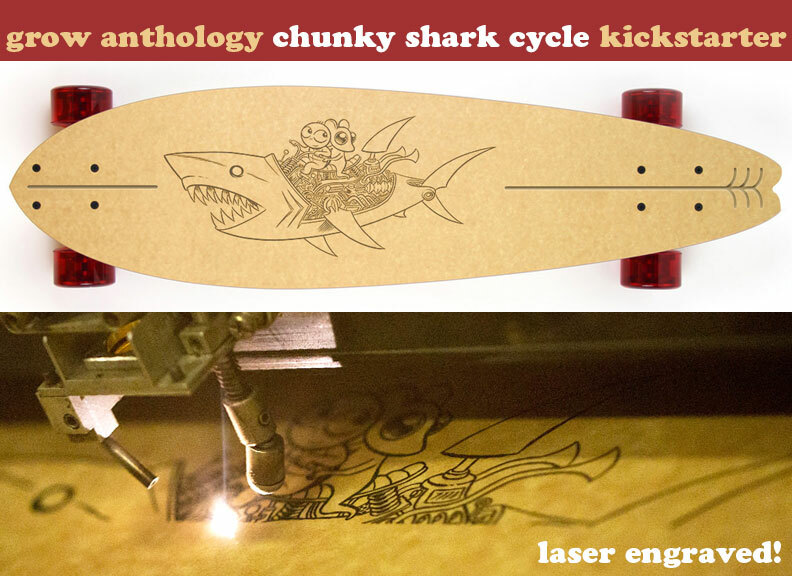 Friends of my brother, GROW ANTHOLOGY, make sweet skateboards out of recycled paper, and they’ve launched a KICKSTARTER campaign to produce their first run of artist-edition boards – THE CHUNKY SHARK CYCLE! It’s limited to only 250 boards… Chunky and Dandel graphic laser-etched into the top of the deck… made sustainably from recycled paper from a paper mill in my home town! 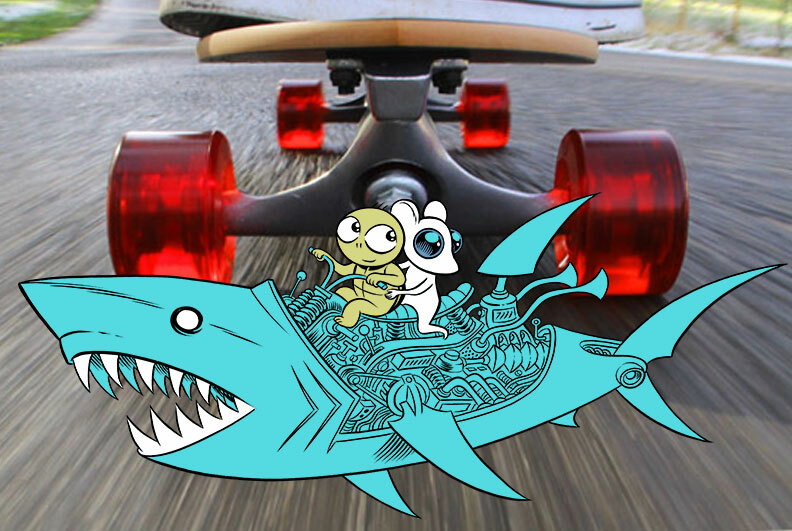 They’re a flexy-fluid longboard ride or an object of art for display. Please, do check in to support the Chunky Shark Cycle Kickstarter and get stickers, t-shirts, decks, complete boards, or purchase my original art. Exciting to merge the two passions of my youth – comics and skateboarding! Hi Craig! I will follow you in Instagram! Cool skateboards! OMG, as a huge fan of Chunky Rice, I love this post. Would you make posters or some prints of that image for those of us that don’t skate? I find it amazing. And even if I don’t have Instagram, I just marked that page into my favourites, as to not to miss any news on the book. Keep the great work coming! Very cool. Does this mean you won’t be posting future updates on the blog? hi craig, ive just finished the review of czech translation of habibi (the lettering and the translation itself is perfect, by the way). ive got both original and czech copy, and i dare to say it became my most favourite graphic novel ever (along with joe saccos work). myself, im huge “fond of” arabic world and culture (more than religious issues, even though i find it very interesting from the historic point of view) as it started some time ago in morocco. this is why i like your carnet de voyage; the impression was very similar (as im lone traveler) but i fell in love with this country and i visited few arabic countries since (including palestine, therefore kudos for sacco). and i know im gonna be back again. and again. funny thing is that i didnt really like blankets, as it way too much resembles david bs l’ascension du haut mal, which i love and hate at the same time (same two-way feeling similar to them for chris ware, maybe overwhelming/unbearable is the right description). anyway, all i wanted to say is that i really admire your work and honestly hope to meet you someday to, well, ask & talk. all the best from prague, jana. That board looks lovely and nice to see Chunky and Dandel reunited (loved the story but it made me sad for days). Sadly I am in the UK so cannot purchase.